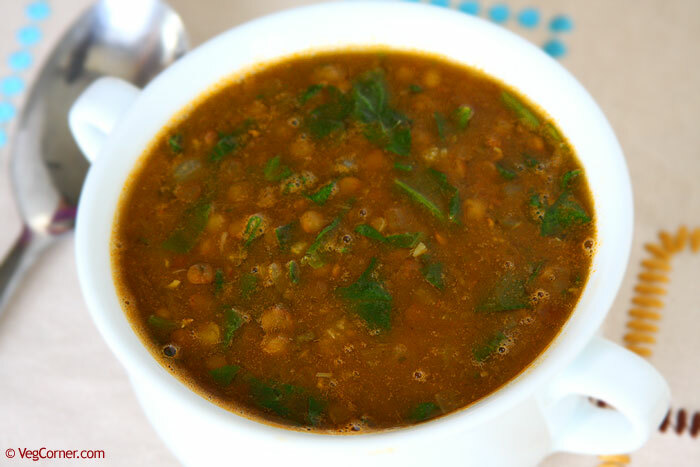 Vegan Lentils Spinach Soup: I love to make soups for dinner because it’s hassle-free, one-pot dish, and my pressure cooker takes care of the work. No standing in front of the stove for hours, or spending the time to prepare the main entree, side dish etc. The catch-phrase “shut it and forget it” very well works for pressure cooker soups too. Another advantage, because I make a big batch, I have got one other meal for the next day covered too. I usually have the leftover soup for breakfast, lunch or dinner the next day. On school days my eldest son will take the soup for lunch in his thermos. So it’s a win-win meal idea. 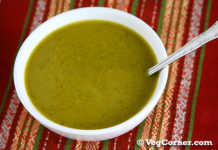 This curried lentil spinach soup is even easier than the other soups I make. You just have to cut the onions, garlic, and spinach. No other chopping work. None, I promise. I have used marinara sauce in place of tomatoes. So no chopping of tomatoes. One less work to do. I buy Kirkland’s marinara sauce from Costco and most of you know that it comes in a pack of three bottles. Even though I use clean and dry spoons, close the lid properly and store it in the refrigerator, sometimes I spot mold growth. 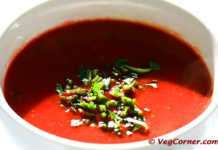 That’s when I started using marinara sauce in recipes, especially soup recipes in place of tomatoes/canned tomatoes. By doing this I end up using the sauce quicker and avoid wastage. But be sure to get a brand of marinara sauce which has ingredients that you can recognize and not loaded with preservatives and vegetable oil. Even though the Kirkland brand of marinara sauce is not organic, I buy it because the list of ingredients is simple. Tomatoes (tomatoes, tomato puree, salt, citric acid), fresh onions, extra virgin olive oil, fresh garlic, fresh basil, sea salt, black pepper. This is the reason I don’t mind buying a 3 pack. But make sure that you don’t add too much salt in the dish when using the sauce because it already has enough salt in it. This vegan lentil and spinach soup is the easiest soup recipe you will ever make. No chopping loads of vegetables or spending hours in front of the stove and yet you end up making a delicious and healthful one-pot meal. In a pressure cooker, heat oil. Add the bay leaf and fry it for a couple of seconds. Then add the chopped onion, garlic and kasoori methi and fry for a minute or two. Add a pinch of salt so that the onions will cook quickly. Now add the sauce, lentils, curry powder, turmeric powder and salt. Add about 6-7 cups of water. Check for seasoning and add some more curry powder/salt as required. Close the cooker lid and put the weight once you see the steam coming. Leave it for 3 whistles. Remove the lid carefully once the pressures is released and simmer the soup on low heat. Add the chopped spinach leaves and heat the soup for another couple of minutes until the spinach wilts. Add lemon juice, cilantro and stir well. Serve it warm. This protein-rich, filling lentil spinach soup can be made in a jiffy but tastes like you have spent a lot of time in front of the stove. The marinara sauce not only makes it easy to make this soup but with all its flavor and spices, it enhances the taste to a great extent. 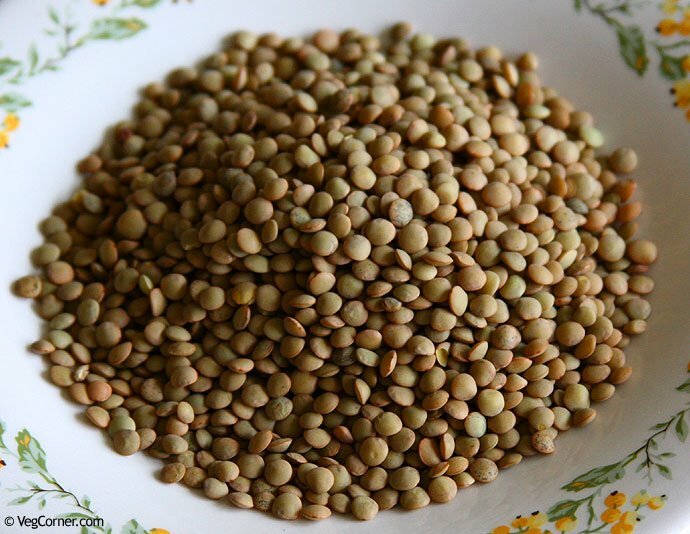 You can use other types of lentils like green lentils, puy lentils etc. Even though these lentils do not require soaking, I do soak it overnight to get rid of at least some of the phytic acid/phytates. To know more about this read this very big article. If using other legumes/beans, dry roast the beans for a couple of minutes, until it’s hot. Soak it in hot water for at least an hour, drain the water and then proceed with the recipe as above. You can still make this recipe without pressure cooker, but it will take more time. I’m thinking at least 30-45 minutes for the lentils to cook completely. I haven’t tried it in slow cooker, but I bet it should work too. You can use Sambar powder too instead of curry powder or plain black pepper should be good too. Use chopped kale instead of spinach. The reason we are not adding spinach with the rest of the ingredients is because we don’t want it to get cooked too much. If using kale, chop it finely and give it a minute or two extra at the end. Just like using marinara sauce in soup and other recipes, I do the same with salsa too. 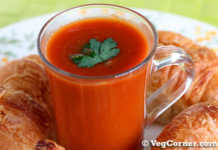 I use it in soups, Quesadillas, the bhaji for Pav Bhaji and other vegetable gravy recipes which uses a combination of onions and tomatoes. Omg I want to try all your recipes so badly, but we never have time at our house to cook meals at home! We’re constantly on the go!!! You’re amazing by the way. Thank you very much, Pratap. Little menu planning over the weekend for the week ahead helps a lot. Hope you can try it.